Disclaimer: there are mild spoilers for the book and major spoilers for the first season of The Handmaid’s Tale in this post. 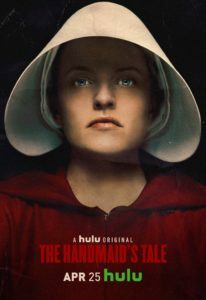 How is it possible that almost an entire year has passed since the release of the first season of The Handmaid’s Tale? It honestly feels like I just finished watching this show. I used to roll my eyes when adults said that time sped up as they grew older, but now I completely understand where they’re coming from. April 25 is the release date for the second season in the United States. Last year, Canada was about a week and a half behind the United States on new episodes. That meant that by the time I saw episode three, for example, people in the US had already seen episode five. It looks like that waiting period for those of us in Canada will be shortened to about five days this year. Avoiding spoilers is going to be easier this time around, and I’m very grateful for that! While we’re counting down the last few weeks until season two begins, I thought I’d list five things I’m hoping to see in it. The first season spent a decent amount of time showing how Commander Fred and his associates built up the social and practical support they’d need for the moment when the United States ceased to exist and the Republic of Gilead was born, but we still don’t know the logistics of how a small percentage of the population was able to take control of one of the most powerful countries in the world. Without giving away too many details for anyone who hasn’t read the book yet, this was something that was briefly addressed in The Handmaid’s Tale. However, Offred was such an ordinary, non-political person before all of this began that she only knew the basics of how her government replaced. She was not privy to any of the details of what exactly happened or how it was planned out. On a positive note, this means that the screenwriters will have a lot of leeway in showing what happened to the previous leaders of the country formerly known as the United States. In the first season we learned that 80% of pregnancies in this universe are now ending in a miscarriage, stillbirth, or serious birth defects for reasons that no one has been able to figure out. The odds aren’t in her favour, but I’m hoping that Offred being the protagonist of a beloved show will make the writers hesitant to kill off her child. Babies who were born with birth defects in the novel version of The Handmaid’s Tale never grew up. It was heavily implied that this was due to at least some of them not being allowed to live instead of their health issues being too difficult to treat. As curious as I am to know how such a baby-obsessed society would rationalize killing an infant who could have lived if they were given medical treatments, I’m crossing my fingers that Offred’s child won’t be the one to show us how this system works if she doesn’t make it to Canada before she gives birth. Is seeing Offred reuniting with her daughter and husband too much to ask for season two? We know that all three of them are still alive as of the end of the first season. Luke is safe in Canada, Hannah is living with a high-ranking official in Gilead, and Offred has possibly been rescued by the Resistance. My fingers are crossed that they’ll be together again soon, even if it turns out to be a temporary reunion for the sake of future plot twists. The Colonies were describe in the book as a place that rebellious, infertile, elderly, sick, and/or politically useless people were sent. Some of them cleaned up toxic waste while others were responsible for tasks like farming. They were a quiet threat to the life of anyone who wasn’t wealthy and powerful who fought back against their assigned role or who had the bad luck of being diagnosed with a serious illness. Based on the previews, we will be seeing The Colonies at some point. Any scenes set there are almost certainly going to make me cry, but I still want to know exactly what life was like for Offred’s mother and other people who were deemed not worthy of being kept around. 5. What’s Going On in the Rest of the World? We already know that Mexico is suffering similar problems with infertility, miscarriages, stillbirths, and life-threatening birth defects in this universe. If the reproductive issues are limited to these two countries, it could point to a specific environmental cause that the characters in this show will eventually be able to fix. On the other hand, we might find out that many other countries are suffering in the same way. My fingers are crossed that we’ll get a peek at what’s going on in Africa, Europe, Asia, South America, Australia, and the rest of North America. I was always a little frustrated with how vague the book was about this part of the plot even though I understood why Offred couldn’t possibly know what life was like thousands of miles away when the news was so heavily propagandized and filtered. If you’re watching this show, what do you hope will happen in the second season?